Heart failure is a condition in which the heart is no longer able to pump oxygen-rich blood to the rest of the body efficiently. This causes symptoms to occur throughout the body. Heart failure is most often a long-term (chronic) condition, but it may come on suddenly. It can be caused by many different heart problems. 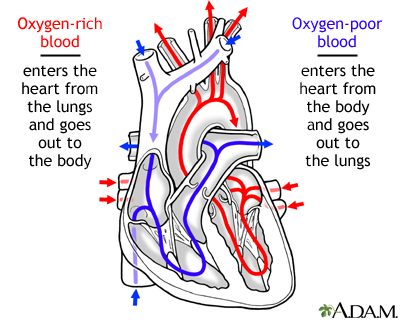 The condition may affect only the right side or only the left side of the heart. More often, both sides of the heart are involved. Your heart muscle cannot pump (eject) the blood out of the heart very well. This is called systolic heart failure, or heart failure with a reduced ejection fraction (HFrEF). Your heart muscle is stiff and does not fill up with blood easily. This is called diastolic heart failure, or heart failure with a preserved ejection fraction (HFpEF). Coronary artery disease (CAD), a narrowing or blockage of the small blood vessels that supply blood and oxygen to the heart. This can weaken the heart muscle over time or suddenly. High blood pressure that is not well controlled, leading to problems with stiffness, or eventually leading to muscle weakening. Symptoms of heart failure often begin slowly. At first, they may only occur when you are very active. Over time, you may notice breathing problems and other symptoms even when you are resting. Symptoms may also appear suddenly after the heart is damaged from a heart attack or other problem. An echocardiogram (echo) is most often the best first test for people when heart failure is being evaluated. Your provider will use it to guide your treatment. Other imaging tests can look at how well your heart is able to pump blood, and how much the heart muscle is damaged. If you have heart failure, your provider will monitor you closely. You will have follow-up visits at least every 3 to 6 months, but sometimes much more often. You will also have tests to check your heart function. Knowing your body and the symptoms that your heart failure is getting worse will help you stay healthier and out of the hospital. At home, watch for changes in your heart rate, pulse, blood pressure, and weight. Weight gain, especially over a day or two, can be a sign that your body is holding on to extra fluid and your heart failure is getting worse. Talk to your provider about what you should do if your weight goes up or you develop more symptoms. Limit how much salt you eat. Your provider may also ask you to limit how much fluid you drink during the day. Ask your provider how much alcohol you may drink. Stay active. Walk or ride a stationary bicycle. Your provider can provide a safe and effective exercise plan for you. DO NOT exercise on days when your weight has gone up from fluid or you are not feeling well. Lower your cholesterol by changing your lifestyle. Get enough rest, including after exercise, eating, or other activities. This allows your heart to rest too. You will need to take medicines to treat your heart failure. Medicines treat the symptoms, prevent your heart failure from getting worse, and help you live longer. It is very important that you take your medicine as your health care team directed. Coronary bypass surgery (CABG) or angioplasty with or without stenting may help improve blood flow to the damaged or weakened heart muscle. Heart valve surgery may be done if changes in a heart valve are causing your heart failure. A pacemaker can help treat slow heart rates or help both sides of your heart contract at the same time. A defibrillator sends an electrical pulse to stop life-threatening abnormal heart rhythms. At a certain point, the provider will decide whether it is best to keep treating heart failure aggressively. The person, along with his or her family and doctors, may want to discuss palliative or comfort care at this time. Often, you can control heart failure by taking medicine, changing your lifestyle, and treating the condition that caused it. 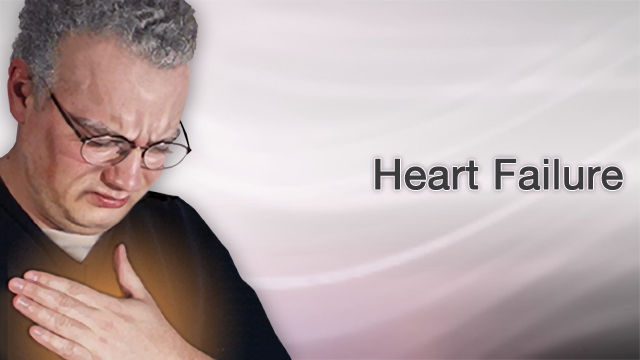 Most of the time, heart failure is a chronic illness that gets worse over time. Some people develop severe heart failure. Medicines, other treatments, and surgery no longer help at this stage. People with heart failure may be at risk for dangerous heart rhythms. These people often receive an implanted defibrillator. Most cases of heart failure can be prevented by living a healthy lifestyle and taking steps aimed at reducing your risk for heart disease. Allen LA and Stevenson LW. Management of patients with cardiovascular disease approaching the end of life. In: Zipes DP, Libby P, Bonow RO, Mann DL, Tomaselli GF, Braunwald E, eds. Braunwald's Heart Disease: A Textbook of Cardiovascular Medicine. 11th ed. Philadelphia, PA: Elsevier; 2019:chap 31. Felker GM and Teerlink JR. Diagnosis and management of acute heart failure. In: Zipes DP, Libby P, Bonow RO, Mann DL, Tomaselli GF, Braunwald E, eds. Braunwald's Heart Disease: A Textbook of Cardiovascular Medicine. 11th ed. Philadelphia, PA: Elsevier; 2019:chap 24. Forman DE, Sanderson BK, Josephson RA, Raikhelkar J, Bittner V; American College of Cardiology's Prevention of Cardiovascular Disease Section. Heart failure as a newly approved diagnosis for cardiac rehabilitation: challenges and opportunities. J Am Coll Cardiol. 2015;65(24):2652-2659. PMID: 26088305 www.ncbi.nlm.nih.gov/pubmed/26088305. Yancy CW, Jessup M, Bozkurt B, et al;. 2017 ACC/AHA/HFSA focused update of the 2013 ACCF/AHA guideline for the management of heart failure: a report of the American College of Cardiology/American Heart Association Task Force on Clinical Practice Guidelines and the Heart Failure Society of America. Circulation. 2017;136(6):e137-e161.PMID: 28455343 www.ncbi.nlm.nih.gov/pubmed/28455343. Yancy CW, Jessup M, Bozkurt B, et al;American College of Cardiology Foundation/American Heart Association Task Force on Practice Guidelines. 2013 ACCF/AHA guideline for the management of heart failure: a report of the American College of Cardiology Foundation/American Heart Association Task Force on Practice Guidelines. Circulation. 2013;128(16):e240-e327. PMID: 23741058 www.ncbi.nlm.nih.gov/pubmed/23741058. Zile MR and Litwin SE. Heart failure with preserved ejection fraction. In: Zipes DP, Libby P, Bonow RO, Mann DL, Tomaselli GF, Braunwald E, eds. Braunwald's Heart Disease: A Textbook of Cardiovascular Medicine. 11th ed. Philadelphia, PA: Elsevier; 2019:chap 26. The abnormal buildup of fluid in the body is called edema. Edema is commonly seen in the feet and ankles, because of the effect of gravity, swelling is particularly noticeable in these locations. 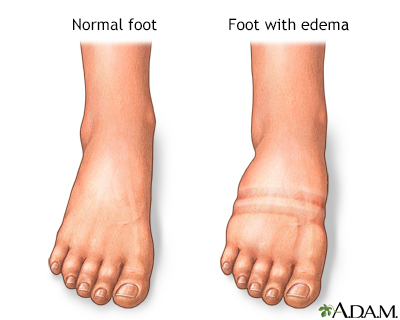 Common causes of edema are prolonged standing, prolonged sitting, pregnancy, being overweight, and increase in age.